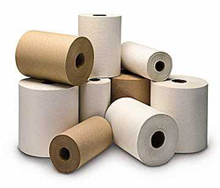 We offer numerous paper products from roll towels, toilet tissue, folded towels, toilet seat covers, center pull towels, wipers, and more!. We have a full line of dispensers from touch less to lever. Light Bulbs are available from standard bulbs to fluorescent tubes to indoor outdoor spots and floods. - All sizes in high density and low density in clear and black. Bay West Folded Towels - Bay West brands from Wausau Paper include a full line of singlefold, multifold and c-fold towels available in white, natural white and natural. DublSoft® premium folded towels offer maximum strength and absorbency while EcoSoft™ and EcoSoft™ Green Seal® folded towels meet customer demands for environmentally preferable toweling.